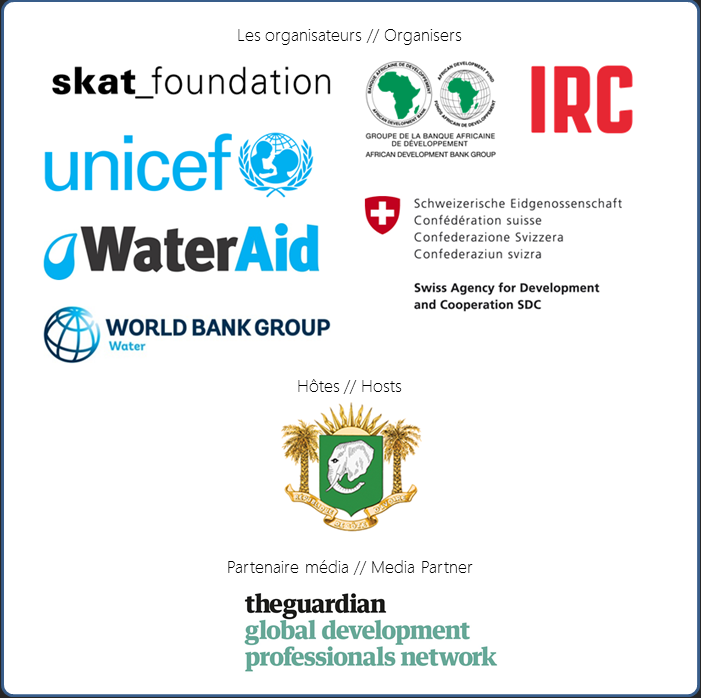 With less than three months left until the RWSN Forum in Abidjan, the programme is shaping up: we now have close to 100 participants registered and paid, and most of the sponsored seminars are confirmed (see this page to find out more) . If you haven’t yet registered, you can find out how to do so here. But first, an important date – all authors which have submitted contributions that were accepted with minor or major changes have until midnight on September 1st to re-submit their contribution through our online platform. These will then be re-evaluated and either accepted for presentation at the Forum or declined. Thanks to all authors who have already submitted their revised contributions! We are also pleased to announce that reservations for the exhibition are now open. Please follow this link to find out more information about the types of booths available and their prices. Email the organizers with your top 3 booth locations (ruralwater[at]skat.ch) to confirm booth location availability, based on the RWSN Forum exhibition plan which you can find on our website. Once your booth location is confirmed, proceed to the online registration platform where you will be able to finalize payment for your booth. (tab: For exhibition organizers). Please do not hesitate to get in touch with us if you have any questions; we hope to see you soon in Abidjan! The RWSN Forum is about bringing together those who are passionate about rural water services, be they water users, practitioners, service providers, political leaders, researchers, funders or policy makers. “Water for Everyone” is the massive challenge that has been set by Sustainable Development Goal 6. We need innovation in many forms – not just new technologies and new knowledge, but also new ways to improve the quality of rural water services so that things that are already working can be sustained and replicated to meet growing demand. That’s where you come in: what experiences do you, or your organisation, have from the last few years that is helping to move the sector forward? What the big opportunities ahead? Can some of the old challenges that have dogged the sector for decades be put to rest? The deadline for first submissions is 30th April 2016.